What is more fun than house hunting? Tweezing my nose hairs one by one for pleasure. Getting a huge tax return and then finding out the IRS was wrong and you owe it all back. Stepping on a huge sewing needle and having your husband pull it out (happened last week). Dropping a cake you just baked while removing it from the oven. Finding an unidentifiable hair in my $8 ice cream cone. Paying for a pedicure and while walking to the car, tripping and scraping your big toe on asphalt. Dropping a cell phone while reaching for coffee at a drive thru and watching it smash into smithereens. Having a talking scale proclaim your weight at a grocery store. Having your pants fall to your ankles at a full sprint on the treadmill at the gym. There you have it. All those things would be better than my past week. Admit it. For a split second you thought this was our new house. But alas, no. Just another attempt to find humor in this very humbling process. Found a house with a missing section of stair railing, half finished floor boards and a faux finish that was a hybrid of a Tuscany and Grecian villa. There may have been a cat sitting in this faux painted window of this random wall. I have blocked out the memory so don't hold me to that. A laundry room that had wallpaper in ginormous, cutesy font with the sentence over and over and over...I HATE LAUNDRY ROOMS. The words each had their own primary color for effective POP! A house with a bay window that had a "fixed" window seat that had issues. Well, those issues were termites and they ate the entire window seat. It was wood pulp. A house that was redone from the inside out and soooo gorgeous. When we arrived, we saw it had a fabulous view of Applebees and Home Depot right out front. Bathrooms that make a phone booth look big. Remember those? A house with an island that was a stove and oven. Yes, the top was the stove. The best part? It was that dingy yellow color and still had the last meal on it. True story. And when we arrived I believe we walked into a house that was once part of a 60's commune. Wood paneling was EVERYWHERE and a bathroom where I believe the only way to use the loo was to climb in it because there was no room to stand in front of it. I know I will have more stories to tell. But get this. We have an AMAZING realtor. He is someone we already knew from church, he is amazing at what he does, and he lets us call the shots. He never pushes us but he is so great about reminding us of what we want when we consider settling for something less than what we are looking for. We have been blessed! But I covet your prayers. I am struggling, I am stressed, and I am NOT standing on faith as I should. It has been a week that has felt like a year and I am slightly panicked. Yes, after a week. I am not a laid back kind of gal. More like an intense, overly worried, freaker outer. But the hubster provided some perspective for me tonight and has ordered me from the "Search Process." He is a good man. And you all are good friends to be vested in this process with me. More updates to come. You all know I am crazy busy right now, right? And as much as I love doing Two Tips Tuesdays, I am not sure I have the time to do this every week. Hubby and I do a class every Monday night and you know all the other house and kid stuff that is keeping me hoppin'! 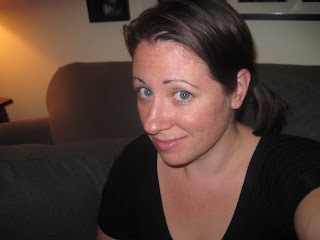 Now I want to see if any of you would be interested in guest blogging for Two Tips Tuesday. It would be a great opportunity to showcase your amazing skills and know how in...well...anything! It would also be a fabulous way for others to peek in on your blog and for all of you to get exposed to other blogs. Interested? Let me know! It will be fun, fun, fun! 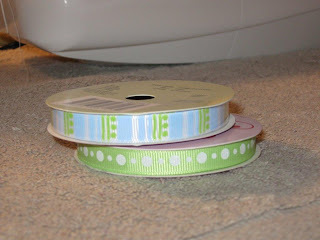 Now I am so incredibly excited to introduce you to Crafty Chic Mommy. MY FIRST GUEST BLOGGER! The first time I stumbled upon her blog, I was hooked. Not only does she have a ridiculous amount of craft genius brimming to overflowing but she makes being craft savvy look like the easiest thing in the world. Plus, she is a brilliant google searcher outer. I am convinced this is a paid title for some genius out there. I love how she shares crafty scoops from the webby world. The wealth of information, sources if inspiration and just crafty flair all make for a fun blog to read. Plus, reading her is like a warm hug from a forever friend. She is so down to earth and sweet all at the same time. So without further ado...Crafty Chic Mommy has an adorable craft with pictures of her scrumptious and even more adorable daughter. Enjoy! Hello Two Shades of Pink fans. You and I are very lucky to have come across this wonderful blog and I'm even luckier to be her first guest poster. I'm always touched when I read Jessica's posts, I feel like I know her personally and to tell you honestly if we lived close I would want to hang out with her. She has a beautiful soul, I can tell, and she sounds like a wonderful Mommy.....she is a wonderful mommy. Thanks for this opportunity Jessica. So a bit about me, then I'll quit rambling and get on with my project. So my blogging adventure starts with google...my favourite search engine. 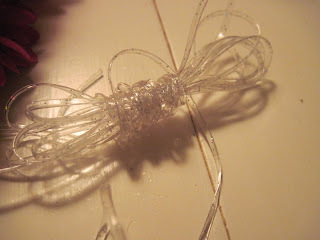 Whenever I needed craft inspiration I would search on google for other brilliant craft website and blogs. 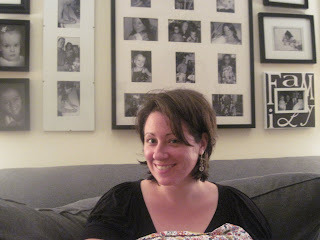 In my search I came across some very wonderful blogs both about motherhood and crafts. Then it hit me....I need a blog. 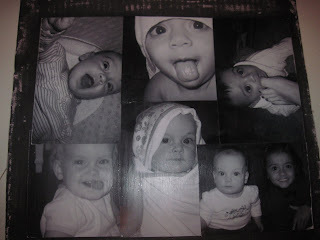 So one rainy day in November 2009 I sat down with my fat free caramel latte and CRAFTY CHIC MOMMY was born. I often think to myself why didn't I do this years ago? Every week I find myself crafting away in the little happy corner of my house, then I take pictures to share with everyone else just like other blogs have done for me. I'm giving back to the bloggy world and it feels good. 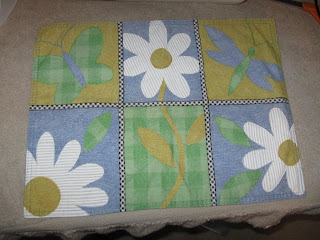 I used a placemat, ribbon and a sewing machine to create this little gem. 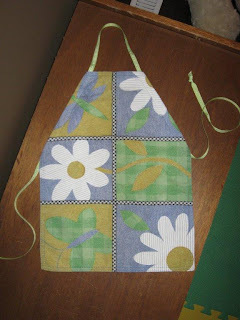 It took me no longer than ten minutes to make only because I had to re thread my sewing machine. 1. Lay your placemat down with the wrong side facing up towards you. 2. 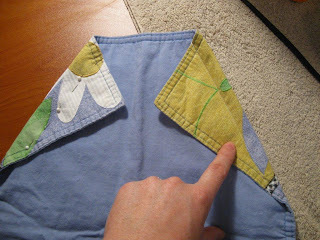 Fold both corners down, and pin them for sewing. 3. 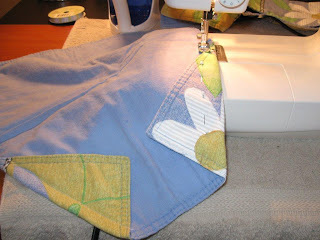 Sew along the sides leaving an inch or so for your ribbon to feed through. Do this on both sides. 4. 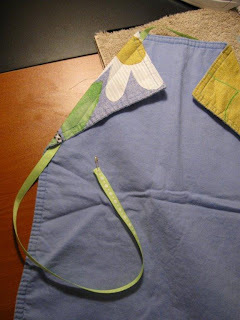 Then take one long piece of ribbon with a safety pin on one end and feed it through each little pocket you've sewn. 6. 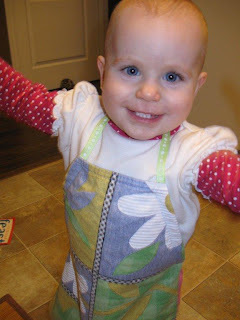 There you have it.... a cute little apron made in minutes and the perfect size for your messy munchkin or your blooming chef. Is this not the cutest? It looks so easy and I love the end result! Now, you must, must go see this amaaaaazing kitchen she did with her own 2 talented hands and incredibly sweet heart. These were so fun to make and fast too!. 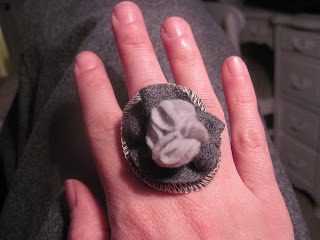 Instead of ribbon, I used gray suiting fabric for the gray one using the selvedge edge (is that the right term? 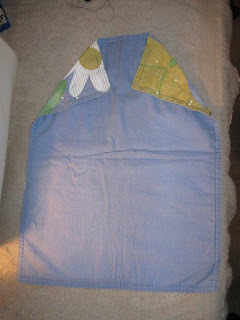 ), brown felt and green scrap fabric with woven looking button, and the hem of a white cotton shirt that my youngest daughter outgrew. 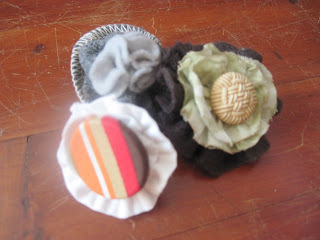 The middle of that one is a fabric covered button using a nifty little tutorial here for fabric covering a button with out using a kit. The best part? The ring is actually a pony tail holder!!! I actually wear these all the time! They are so fun and make me feel girly. They would make great gifts, a fabulous brooch, or a great accessory on a necklace. Or even fun dress up jewelry for a little girl. I know. I have been on a bit of a blog hiatus. 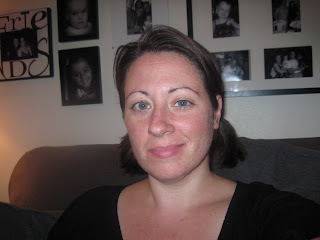 It has made me sad to see some of those precious faces diminish where my bloggy friends are. But I also have realized that my life is utter chaos at this point and what is more important is my family. And with sick children and us in the process of finding a new home, something has to give and this blog is one of those things. But I wanted to just check back in to update you all on what I have been up to besides taking care of sick kids. We are actually now working with a realtor to possibly buy a house. This is the most unexpected turn of events for us as we are greatly lacking in sufficient funds. I wish that came off as an exaggeration but it is true. Yet it seems there are possibilities in this real estate market we were unaware of. And since this is the first time we have actively looked for a house, what have I discovered is that this process is EXHAUSTING, TIME CONSUMING, and ALL TOGETHER EXCITING. The good thing is that we have perspective. We are not getting our hopes up and we are still willing to rent a home if buying does not work out. We have already been approved for a loan and we are being EXTREMELY conservative. In light of that, the choices are slim pickings because what we want does not match up to what we can afford. Tee hee. I can be high maintenance. I just don't want to settle on something to buy. Do you not agree? But this is what I know. God is in the business of doing immeasurably more than all we can ask or imagine. Not only that, but I take complete comfort in God's "NO's" in my life. Each time God has extended a resounding no, I have seen the blessing. He has snatched us from the fire on all too many occasions. 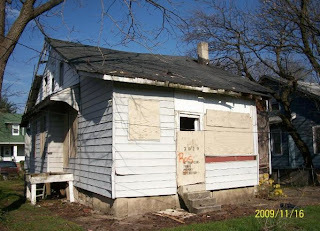 Like the last time we were going to search for a house, we were approved for a loan of $350,000! We laughed and said there was no way we could afford that and scaled back the search process yet the temptation was great. Then one month later, hubby was laid off of his job. He then had to take another job (his current one) making less than half of what he was making before. Wow. Yet we have persevered because...I kid you not...on paper, our budget does not work out. Yet for the last 3 years we have been just fine. For 3 years we have seen God's provision in a mighty way. Jesus, I magnify your holy name. "We see little because we believe little." I know that statement is a tad negative. Because a more positive spin is 'We will see much if we believe much." But the negative highlights where our faith is deficient. And what I have come to know is that the end result is not the reward. It is the faith journey to whatever end result God has already established. Faith is not believing God gives us what we want. Faith is believing God for His best and sometimes His best is a RESOUNDING NO and giving us the last thing we thought we would need. That is the holy God I serve and I rest in His perfect plan for us. So I just wanted to take a moment to say hi to all of you. To confess to you yet again that I still get sick to my stomach when someone decides to stop following my blog, questioning myself and wondering what I did. Then I remember that when I put my hope in what man thinks for me, I have wandered from the path to sanctification that my God has me on. I have focused on the temporal instead of the eternal. I am not of this world. I am merely in it, as an ambassador to Christ. So I have regrouped and remembered that my blog is a wonderful way to give praise to my God and to remember I am not here to please man but to glorify my King. And to remember that I have precious friends, of whom I have never met yet encourage me greatly. For that I thank you. So hang in there with me as I go through a tumultuous process that may result in frequent absences. And please, please always remind me of what is truly important. Will the woman indwelt with the Holy Spirit, who can do all things through Christ please step forward? The one I have been waiting to find Me again? The one who I have missed deep fellowship with, please approach the throne. Of grace. With complete confidence. Hmmmm. Perhaps this will take more than just a loud calling. Perhaps circumstances will weed out the one I have been calling. And so the mercy of the Lord has fallen upon me just like His mercies are found in every trial or discipline. Because every trial draws us closer to him; to deep fellowship, daily reconciliation, and a beautiful, holy yoke that will handle the burdens of life. My life is the one my King knows the beginning to end and all that is in between. Oh, Lord, how good you are. So, so good. You are the definition of goodness in that whenever you discipline me and bring me upon my face I, in holy wonderment, draw closer to the well of living water...and drink DEEP. Every time I am humbled by the living God, I feel immense and purifying RELIEF. Tuesday, I received a call that we would have to move out of our home due to the owner being in the latter stages of foreclosure. 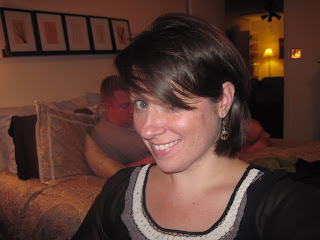 For those of you newly visiting my little blog, hubs and I just rent and have been in our house for the last 6 years. Our story is more understandable from this post. Anyway, we have had no plans to buy a house in this ridiculously crazy market so we have been OK. We can live with the ugly cabinetry, unidentifiable paint colors, terrazzo floors and lack of an ability to update. Because I have been sure I will have a roof over my head. But this? This was so unexpected. We are living on the CHEAP, my friends. Our rent amount is UNHEARD of in this here parts. Out neck of the woods is way overpriced. Let's just say CHA-CHING! So we will be on the move. By the end of April as a matter of fact. 3. A quieter neighborhood with actual grass. Yep, no grass in this yard. 4. A bathroom that can fit two people in and one that is not blue. Yes, our guest bath is blue. There it is. My dirty little secret. Oh, the horror. 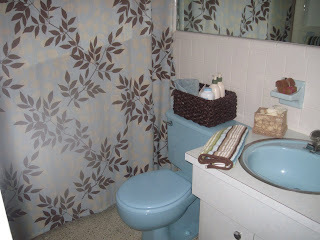 I have a blue, retro, frighteningly ugly bathroom. I did with it what I could by throwing in some brown but really the thing is still ugly at its best. I feel more free just sharing this with you. I have no more secrets from you. None. But now I have this photo to treasure for always. The best part of this whole stressful situation is that God is here. He knew this would happen. And he knows where we will be in the next chapter of our lives. And I am finally paying attention. My life is never what I expect it to be and sometimes my circumstances can NOT be controlled by me. Much to my prideful chagrin. So here we go, folks. Because you might be getting an earful of venting. Or weeping. Or nashing of teeth. If you have not caught on, I don't deal with stress or change all that well. At least not initially. But this I know. God has never, ever let me down before. Ever. Oh, He may have something different in mind than what I first wanted or hoped for. But His way is always better. And eagerly wait for the next. While I obsess a little. I am only human. Here I used black and white photos of the girls when they were a bit younger on a thick piece of cardboard I saved from a discarded box. I just used scrapbook paper and Modge Podge to seal the photos and then distressed the black paper to reveal the pink underneath. 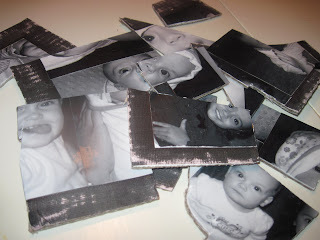 You can cut the pieces using another puzzle as a template or freehand. Use sharp scissors or a craft knife. Other options are to write a love letter or sweet message over the front of the pictures or on the back. 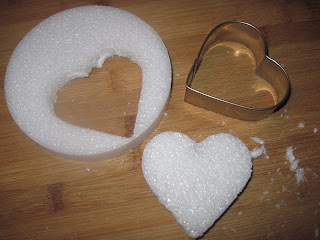 I plan on baking some wonderful heart shaped, sugar cookies for my sweetie. (Like above but with a fun message) After icing them, I will write out a message on each of the cookies. Once they set, all the cookies will be put in a pretty container for my fabulous husband to figure out my love message to him. Just like a puzzle but you GET TO EAT IT! You know, I thought of this idea but I have to confess that I am nervous to implement it. I think it is such a nice idea and it would make someone's day. I thought about buying one or two bouquet's of flowers and have Cati and Ella hand out flowers to people in the check out line at the grocery store, at the library, or neighbors. I have to admit I am not always comfortable putting myself out there but I believe nothing would communicate the love of Christ like a gesture such as this. Would anyone be willing to do something like this with me? Just to bless someone for no reason? I think I would be encouraged if some of you did it with me. 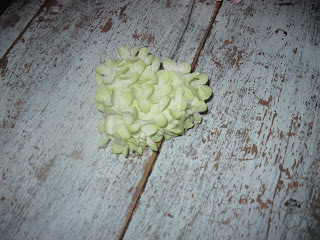 And seriously, who could refuse a flower given from two cutie, patootie little girls? Oh and PS: I think this week I am going to renege on my promise to post every day with the loooove theme thingy. I overextended myself. So since I am accountable to no one regarding this blog I seriously questioned the undue pressure. Now I will post when the mood strikes. Why? Because I am feeling stressed about it and that is just silly. I am going to stop over-committing myself to things I have no time to do and just blog when I am inspired...not because I gave myself a schedule. Amen and amen. The End on my little self pep talk. I decided that this whole week will have a Valentine's Day Theme as part of the post. Monday through Sunday. That is seven days of craftiness my friends! 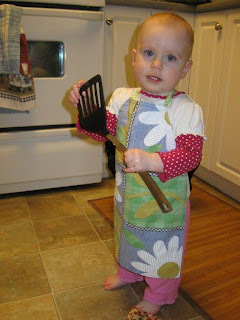 It might be about food, kiddie stuff, ideas that you can use at other times of the year rather than just Love Day (hint, hint) so stay tuned this week for some fun stuff. 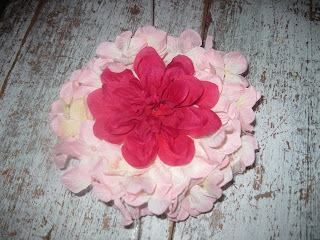 I love getting craft inspired and this week it is is all about the L.O.V.E. 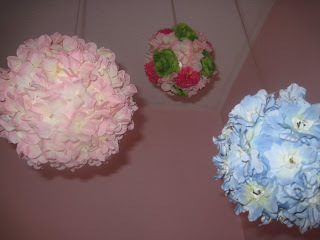 These pretty flower balls hang from the ceiling in Cati's room. They were really simple to make. I decided to do this project again but with more Valentine flair and share it with all you wonderful friends who visit me here. I was convinced that all I needed to do was go to the dollar tree for my simple valentine decor but to my crafty dismay...the balls were gone. But when handed lemons I make a mean lemonade. 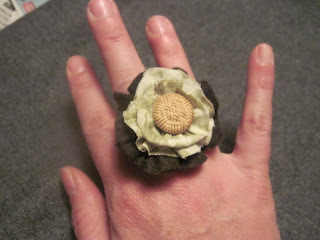 I shall call this a Hanging Flower Ring. 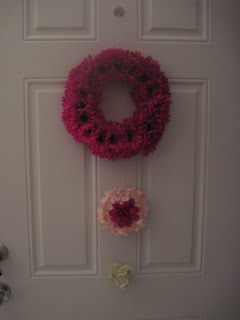 I can't think of it as a wreath because it is suspended from a ceiling or hook. 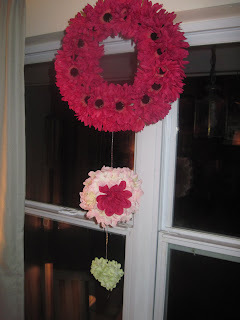 By the way, making this and the flower balls are exactly the same, you just use different shapes. You will need all the supplies listed above above but replace the balls with the ring and 2 discs as pictured here. It takes about 3 or 4 rows to fill up the ring (depending on the type of flower you choose). 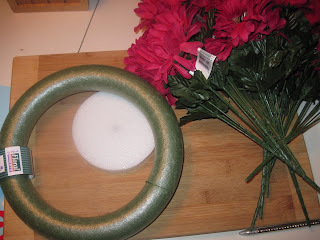 Next, I glued flowers to one of the round discs. 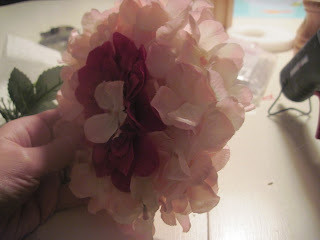 With this one, I put a different type of flower (hydrangea) and did the exact same trimming of the stem. I put another flower in the center for contrast. 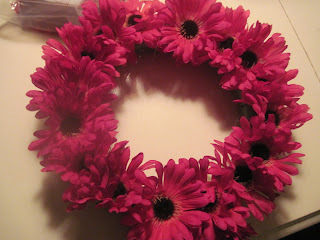 I glued flowers around the edge as well. For the other disc, I used a cookie cutter to make a heart shape. Then I chose green flowers for the heart and did the same as the ring and the disc shapes. Finally I used this plastic cording (have no clue what it is called but it is fun since it has a tiny bit of glitter and cost .79 at Joann's). Sorry for the dark pictures. I took these at night. I secured a straight pin through the cord with a little hot glue to secure it. Here I have it hanging on a front door as an alternative to suspending it from the ceiling or hook.I like that is is not too Valentine looking except for the little green heart at the bottom. But I think only I know that is a heart. And it's green. So that's good. Did you also notice I used TWO SHADES OF PINK? Huh? Huh? You love that I am a geek. You know you do. 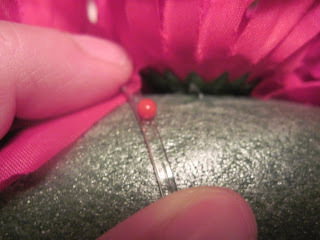 Do you have a crafty Valentine crafts you have done or posted? If so let me know! I would love to come visit you and leave a comment. 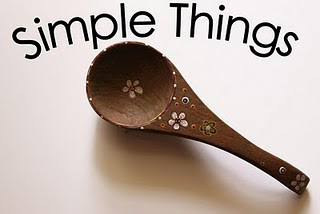 The Simple Things: LINK UP! I came across a post over at Butts and Ashes by Marla who I seriously wish I could meet in person. She is so raw, so real, and a humanitarian to the lost, the broken, the needy. I love her heart. She has linked up to a blog, Enchanted Oak who has committed to donate $2 to Heartline Ministries for every blogger or commenter who posts a list, poem, or prose piece about the joys of the simple things in life. After that you just notify her about your post. This link up lasts until midnight Sunday. Easy peasy! Catching the eye of my oldest daughter and both of us bursting out in laughter. I could go on and on. Please link up to do this. What amazing perspective this gives as I remember I am so blessed in the little things. Let's pray for the many people in Haiti who do not have the luxury of the simple things we often take for granted. The big change...a new do. Chopping off my tresses. Going drastic. 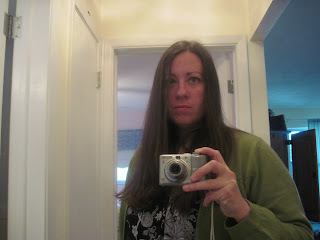 Severing of about a 12 inches of hair. Yes. That's right. A. FOOT. OF. HAIR. Does this or does this not look like I was taking my own mug shot? But there are the long locks that really needed some assistance. I had become a mommy, lost the layers I previously had and became a retro throwback to a generation before my time. This was the night I got it cut. Still not sure how I feel about it. Seriously. I mean, this amazingly skilled stylist sat me in the chair for 2 hours and schooled me on the horrific products I was using that are NOT good for my hair (woops) and then taught me how to style my hair detail by detail. I was so excited when I got home! I was going to be able to make these follicles look FABULOUS! So the next day I ran on the treadmill and produced more than a healthy glow. Let's just call it what it is...I had an odiferous sweat going on. I showered and the moment of truth came when I wet the masterpiece that she had created by putting my head under the shower. But no worries, I told myself. I was now equipped with new KNOWLEDGE. She was my beauty Yoda and I was her young skywalker-esque novice in hair-ology. I go to do my hair like she said and realized I was not listening totally forgot what she told me. I DID NOT REMEMBER THE BEAUTY FORCE! What on earth is up with my Star Wars references? Go with it, Jess. Just go with it. So I did the best I could and here is what I did. All by myself. Really. No help. 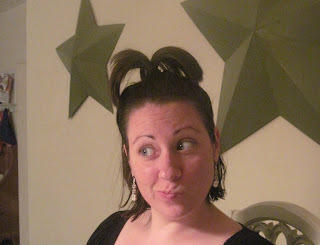 I think I began mingling different hair eras together and got confused. We have the cute little pig tail look. Cute but more appropriate for a run on the hamster wheel or movie night with the family. I mean I am thirty...ish. I thought of more justification for the pigtails since I am digging the fact that I could actually put it up in some way. This works for the gym that I never go to, the beach, or even grocery shopping. Don't I look like two different decades of SNL with the church lady look & Mango's hair? 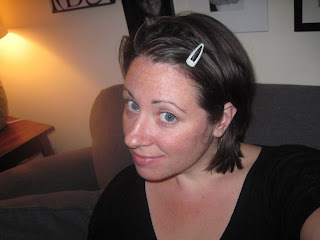 OK. Sassy little clip is working for me here. That was a much needed break. I suppose you may be curious about the "why" since the "what" was obvious that I wanted to spend more time with my girls. I guess I have been in a life slump and just needed to remember what is important. I was making so many selfish decisions that benefited only me, myself, and moi. Plus, this blog has become what I did not anticipate with such a fun little writing outlet. I will tell you that honestly I would peek in on my email numerous times a day just to see of someone stopped by my little blog. I would cruise other blogs like crazy and I do believe I would be appalled if I added up all the minutes I did this throughout the day. A waste. Here my girls are asking me to play, hugging my knees with mac and cheese hands, and I am more concerned about what people in the blogosphere are saying to me. Then my BFF, often the voice of reason, said something that stopped me in my tracks. She said that often, as moms, we feel like we are living in the midst of a thankless job in this particular season of our lives. After confessing this to her and appealing to her for her wisdom, she said that perhaps I had a need to feel appreciated or distinctive in some way outside my normal mommy role. And in blog-land I find it. Oh such wisdom. No truer words have never been spoken about the quiet place in my heart that no one can see. Sometimes I feel like I am never me anymore. My name is Mommy and that is it. I wanted that title for so long that it pains me to admit how misinformed I was. Basically since I conjured up my own fantasy land and went to live in there. I just thought I would dress up these cute little peanuts, play with them, show them off to the public, and throw in some scripture for a happy, DIY, simple upbringing. Um, Jess? Visit reality much? This parenting thing is so wonderful, so incredible. It touches places in my heart I did not even know existed But this ride is certainly not a simple one. And it it is teaching me so much about dying to self. To literally be a servant to God in my home. That is a hard pill to swallow, friends. If I had it my way, I would read, craft, and drink coffee in my spare time. My reality tells me to fold that laundry waiting in the basket for 3 days, get the dishes out of the sink, plan that menu, give my hubby the respect and home he deserves and hug your little girls a gazillion time because they won't be little for long. Cati blows her nose and then puts the tissue BACK IN THE TISSUE BOX. Lovely discovery. I had just thought they pulled them out and stuffed them back in. They both discovered that inserting raisins into door knobs is a favorite pastime. I can assure you they are not exclusive to raisins. Bendaroos, craft pom pom balls, paper, and littlest pet shop toys that can only be viewed under a high powered microscope. Ella is talking more and more every day. Her latest? "No. No. Nonononononononono." But my favorite word she can say is Play Doh. But she needs to say it. Not eat it. Cati & Ella no longer enjoy my singing with them. I am told it is "Cati & Ella time." Okidokes. I have discovered that a British accent (of which I do an inexcusable job) renders fear in my children rather than fun. I made a note to self: British accent, though all together dignified and lovely (like calling a pimple a "spot," prounounced "spaught") is not fun to little children." It instills fear that mommy does such a poor portrayal. I shall stick to my mixture of NJ, NY, MD, with a dash of southern. That ain't so pretty either but it's what they know. Cati has become extremely exuberant about her awareness of her private parts. This is a work in progress to tone down her "Go Tell it on a Mountain" proclamation of said parts. Ella prefers to offer up affection on her own terms but my arms are open whenever she is ready. So I think I am back on track again. I have so many fun ideas for this blog but no time for the application of them. So right now I will continue to wing it in the hope that all of you are along for the ride with me. P.S. Big change a-brewing tonight...I am getting a haircut. MAJOR SEVERING OF LENGTH I tell you. Before and after pics to come. I am nervous. Excited. OK. I kinda want to throw up. But this is so necessary.